Where did the week go?! It’s Friday, It’s August and I feel like my summer has been in a vacuum! There have been so many fun things going on this summer including getting married, going to other friends weddings, concerts, camping, cooking… time flies when your enjoying life! Each time I go to the farmers market the produce gets a little more plump, ripe and delicious for new recipes! Yesterday was scorching hot and the last thing I wanted was a warm lunch. 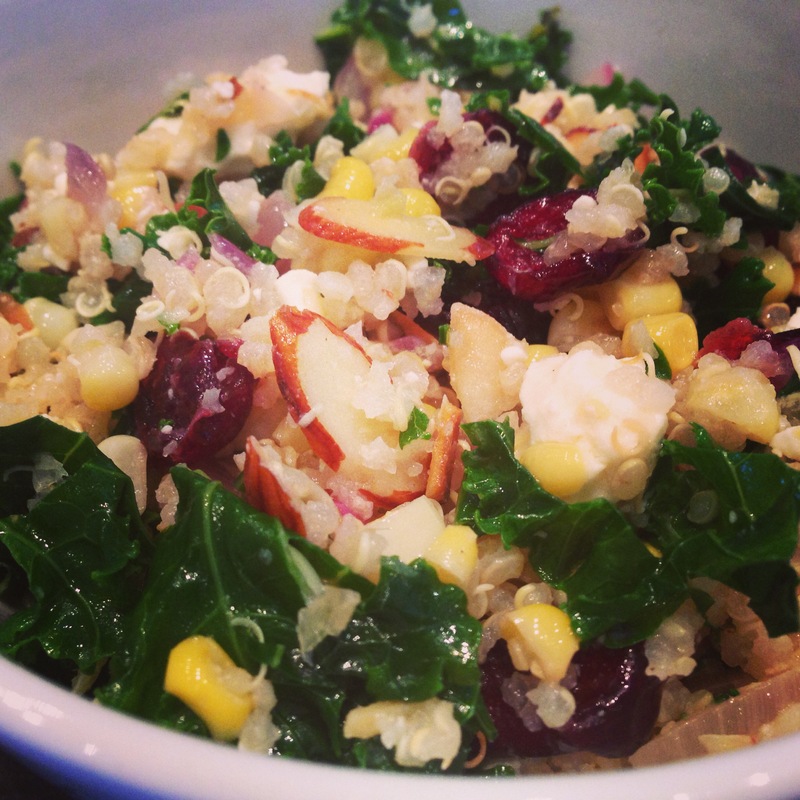 This quinoa salad is a perfect cold side for lunch, dinner or afternoon snack! 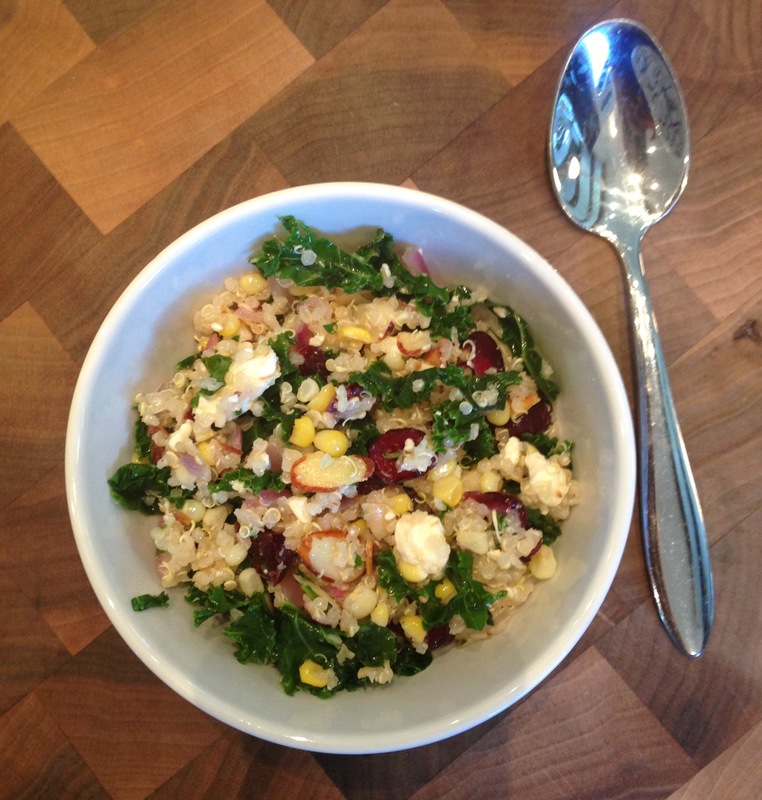 The sweetness of the cranberries and corn balance the tartness of the feta and kale for the perfect mix of summer flavors. Enjoy the weekend! Saute red onion and corn until the onion is translucent and tender. Add kale. cook until kale begins to wilt and turns bright green- about 5 to 7 minutes. Remove from heat, set aside and allow it to cool. 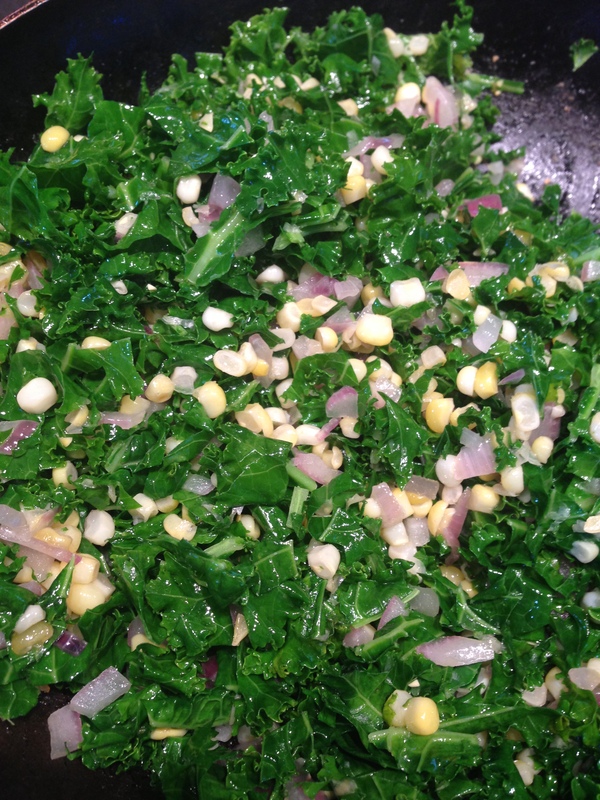 In a large bowl, add cooked quinoa, kale, corn and onion saute, toasted almonds, and cranberries. Drizzle 1/4 cup of olive oil and juice of 1 lime over the ingredients and mix thoroughly. Add Feta cheese and season to taste with salt and pepper. Toss once more and refrigerate for 1 hour or serve immediately. Enjoy! This entry was posted in Entrees, Friday Favorites, Recipes, Salads, Sides and tagged Corn, Cranberries, feta, Kale, quinoa, toasted almonds by skibootsinthekitchen. Bookmark the permalink. mmm! This reminds me of the yummy salad at Silver Star!